Manufacturers may label their performance vehicles as “sports cars,” but 99-percent of the time these cars are hardly ready for a performance driving environment. What does everyone tell you to do before you take any car to the track? They give you a checklist, usually suggesting at minimum to replace the brake fluid and brake pads, then swap out wheels and tires, then suspension, and the list goes on. When the receipts start adding up, no one can blame you for feeling cheated that your sports car required so much money and effort to just survive a track day. 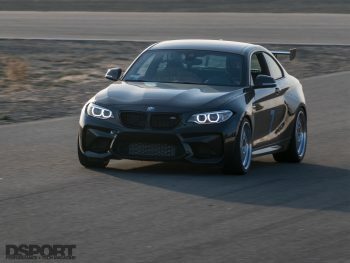 Very few cars can readily hit the track as they leave the factory line; however, the recent BMW M2 proved itself to be a rare exception. In search of its next house project, Supreme Power out of Orange County, California took note of the BMW M2’s performance out of the box and took on the challenge to enhance its track ability even further with a series of handling upgrades. Supreme Power specializes in turning wrenches on sports cars and supercars in the Southern California region, offering performance parts and track setups for its customers. A recent move to a 10,000 square-foot shop and office, paired with some backend restructuring called for a new project to represent the company. This came in the form of the 2017 BMW M2; the German manufacturer’s revival of a compact, nimble platform that drives like it was born for the track. While the M2 already outperforms most cars on track in factory trim, Supreme Power isn’t in the business of leaving cars stock. 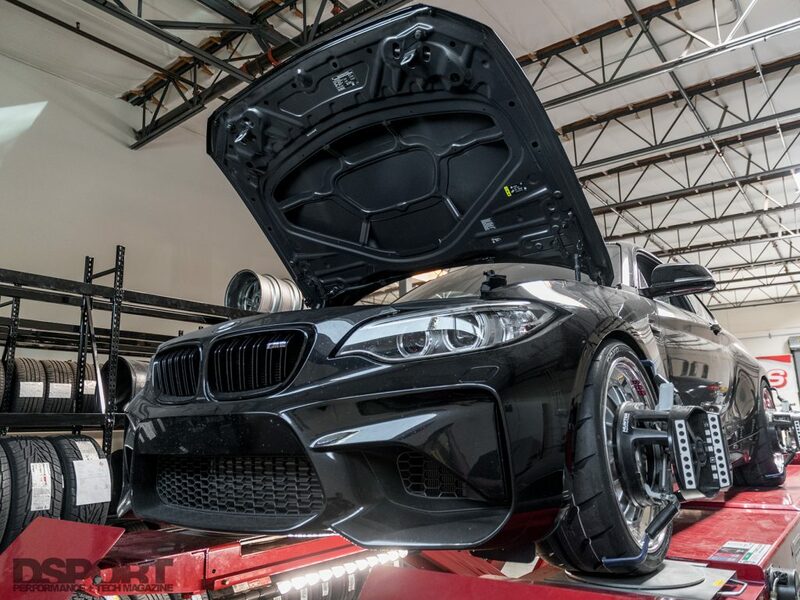 The plan for this M2 lies in a series of upgrades for it to serve as a test bed for various parts and setup changes, proving each modification’s benefits on the racing surface or on the dyno. The beginning stages of development entailed only upgrades to handling performance, saving the power gains for later. All the while, I was the lucky one assigned to do the behind-the-wheel testing. The BMW Motorsport wing from the M235i Racing car greatly inspired confidence in the M2’s ability to stick through the corners. It enabled speed differences of more than 5 MPH through some higher speed bends, effectively reducing lap times. 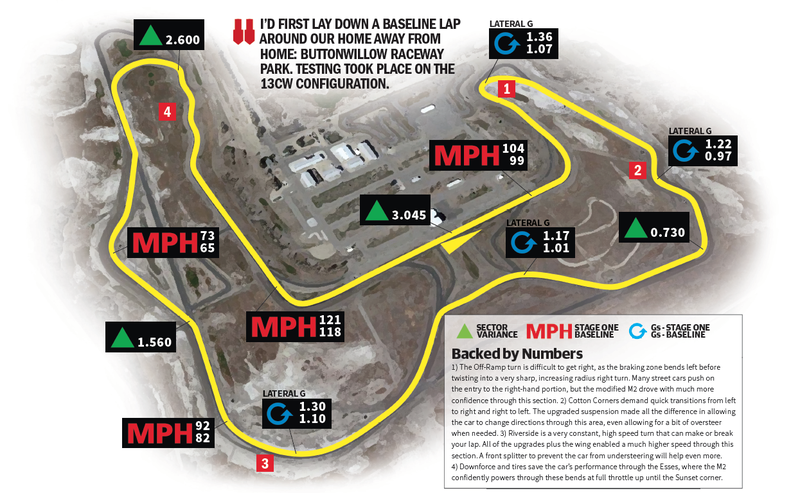 Before tearing the car apart, I’d first lay down a baseline lap around our home away from home: Buttonwillow Raceway Park. Testing took place on the 13CW configuration, where our Fiesta ST and ND MX-5 projects also turned numerous laps. Just like previous baselines, the M2 would hit the track in full factory form with a full tank of gas. After a few warmup laps to get comfortable with the car, I dialed up the speed in search of the car’s limits. 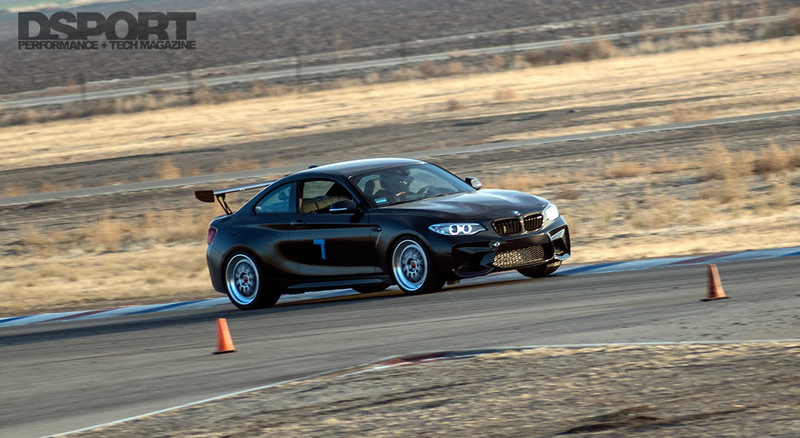 As the speed came up, the M2 felt more and more at home on the track. This model is one of BMW’s shortest wheelbase cars, as well as one of the lightest. This enables it to be driven hard and thrown sideways into the corners to get the best exit, as opposed to a smoother, composed driving style. Although the M2 is nimble, the test revealed some tendency to understeer on corner entry, but most of this was cured with extra trail-braking. At 3,600 pounds and 365 horsepower out of the M2’s twin scroll turbocharged 3.0-liter straight-six, the car powered out of the corners with ease. The 343 lb-ft of torque (369 lb-ft when the overboost function kicks in) helped especially in the tighter third gear corners, even delivering a bit of wheelspin on the way out. 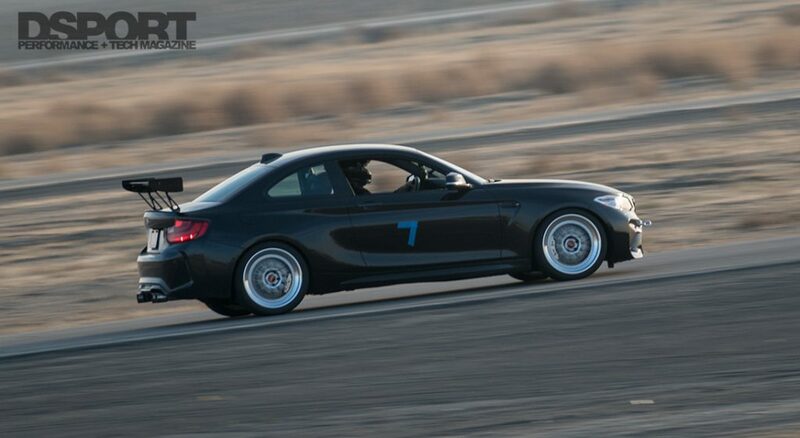 As for braking and suspension, the M2’s components handled the punishment of the track very well with few shortcomings. The stock braking system actually held its own better than expected, only gradually developing brake fade over the course of a 20 minute session, without ever alluding to a surprise pedal-to-the-floor situation. While the brakes proved more durable than expected for a few short sessions, the heat signatures on the rotors and the pad material wear showed that these components wouldn’t survive too many track days. The stock suspension, even in the car’s Sport modes and with the DSC switched off, came up just a little soft. The car gripped well through the corners, but its responsiveness could use some help, especially through Cotton Corners and Bus Stop. Regardless, when comparing cars in bone stock form, the M2 stands as one of the most track-ready models we’ve ever tested. By the end of the day, it turned a 2:02.06 around Buttonwillow’s 13CW configuration, just over ten seconds faster than our Fiesta ST and ND MX-5 D’Garage projects when measured in stock trim. The Brembo GT-R Kit and TR RE10 pads would undoubtedly improve stopping ability, but the most important benefits are the consistency and longevity of this hardware for extended periods of hard driving. While the Supreme Power M2 project is intended to serve as both a street and track car, it’s likely to lay down most of its miles at the race track. 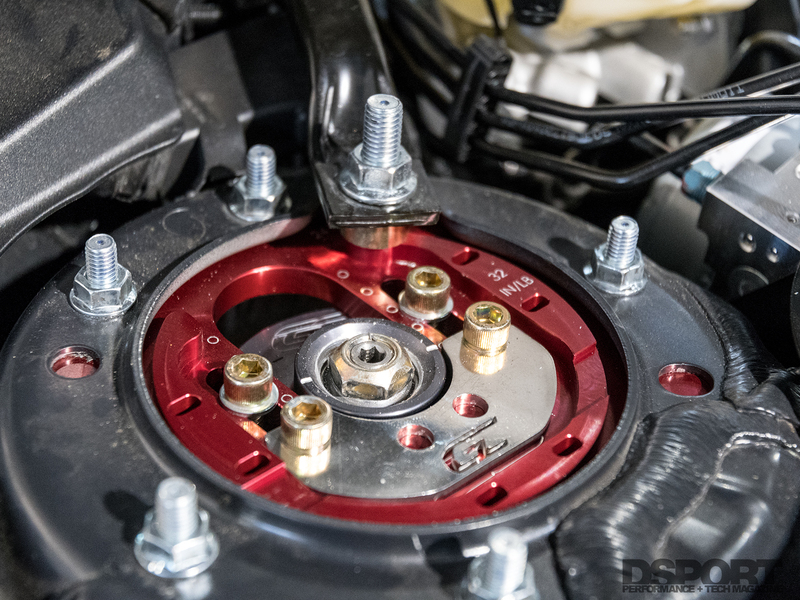 This calls for an upgrade to the braking system, particularly a solution that can withstand the heat and constant hard use that comes with track days and time attack. 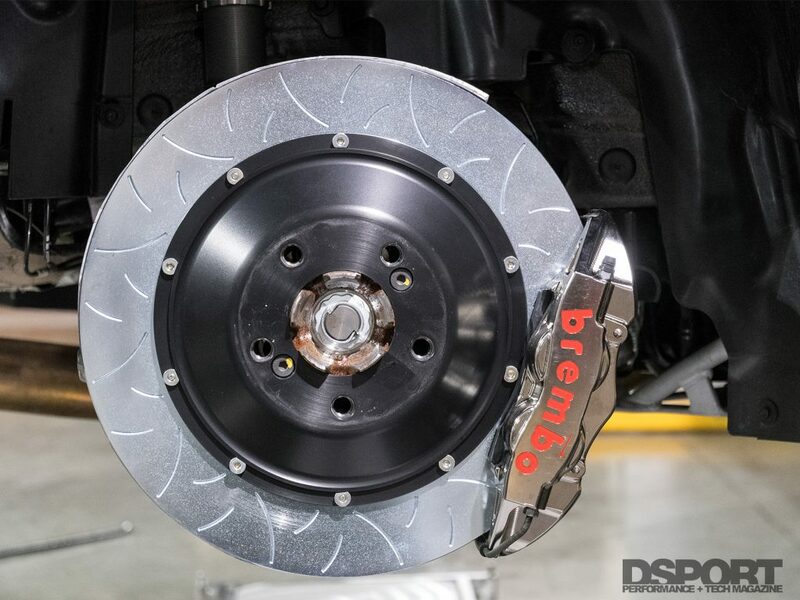 Sparing no expense, the Supreme Power team fitted Brembo’s GT-R Kit to the M2. This kit makes use of single block billet aluminum calipers, 6-piston on the front and 4-piston on the rear. Two-piece 380mm Type III floating rotors sit at all four corners, paired with the aggressive RT RE10 pads. These pads utilize an endurance race compound to provide excellent stopping power but with extremely high heat tolerances and low pad wear for extra longevity. The BMW M2 in factory form didn’t allow for the amount of negative camber adjustability we needed. 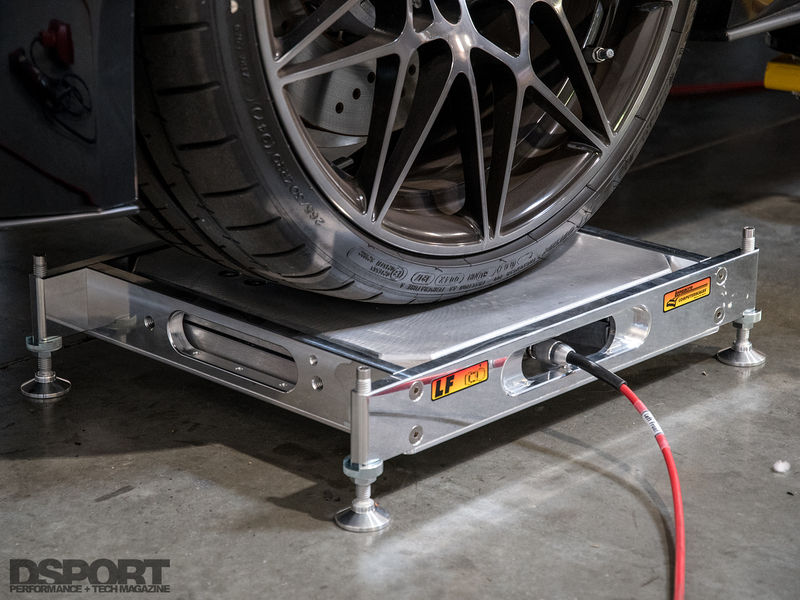 Ground Control camber plates enabled us to reach the desired settings quickly and easily. The Brembo brake upgrades would provide more than enough stopping ability, so the Supreme Power team moved onto suspension next. 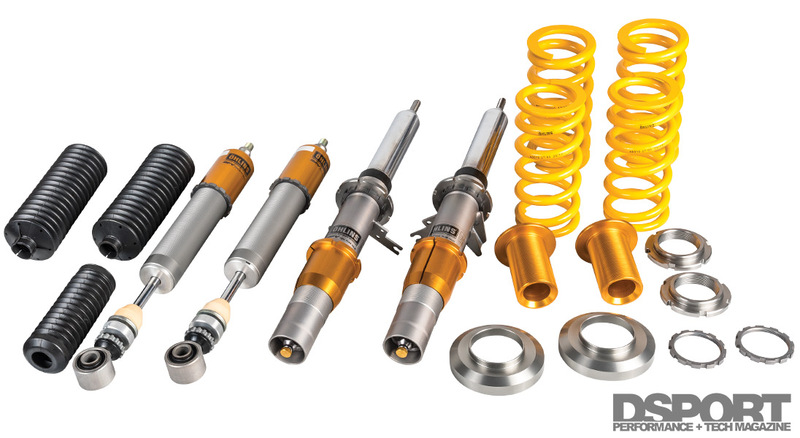 In the interest of maintaining streetability while offering track performance, Öhlins’ Road & Track suspension was the top choice. This hardware employs Öhlins’ Dual Flow Valve (DFV) design, along with single damper adjustments that affect low and high speed damping on both compression and rebound. 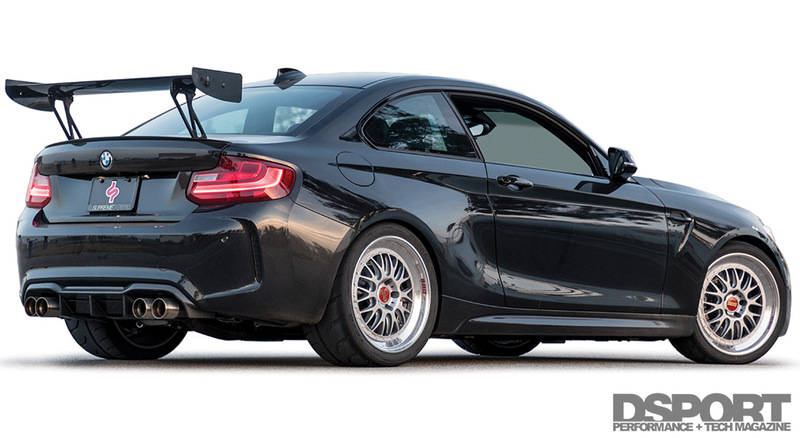 Given this suspension’s ability to adjust ride height as well as damping characteristics, the M2 could be fine-tuned to emphasize the car’s handling ability and match up with anyone’s driving style. When the car went back on track with the upgraded brakes and suspension, the car immediately felt much better than stock. The brakes remained consistent throughout the session and the suspension reduced the car’s lean significantly. However, even with the new brakes and suspension, the car only barely outperformed its baseline lap times, achieving a best of 2:01.93. The lack of improvement comes off as strange, especially since the M2 took to a nearly perfect cross weight, a lowered center of gravity, and a braking system that could readily handle a 24-hour endurance race. Despite all this, the stock Continental SportContact 3 tires couldn’t exceed the limits that they already demonstrated in our baseline. Next, we’d find out how much the tires restricted the benefits of the other upgrades. Given the car’s dual-purpose of street and track, Supreme Power decided to go all-out with the motorsports look and performance with its wheel and tire selection. 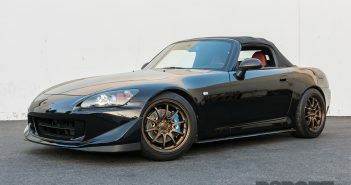 Calling to a more classic racing aesthetic, a set of 19×9.5-inch and 19×10.5-inch BBS Motorsport E88 three-piece wheels replaced the stock BMW wheels. Toyo Tires R888R 265/30R19 and 295/30R19 rubber served as the tire choice to fit onto the wheels. These D.O.T. 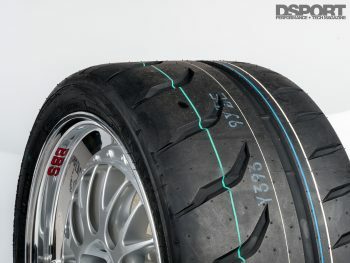 competition tires come with a 100 AA A UTQG treadwear rating, so they are technically street-legal but recommended for track use. Based on our past tests with this tire in the D’Garage ND MX-5 Miata project, we learned that although the R888R rolls with a lot of cabin noise, it is one of the fastest and longest lasting tires in its class. We mounted the upgraded wheels and tires in the paddock and set out to the track once again. The R888R tires find their peak grip and handling characteristics within the 32-38 psi range and between 160 to 220 degrees Fahrenheit. We started with 28 psi in the tires, anticipating the pressures to rise at least 6 psi as it was a cold day. Grip came in quick, as the car broke the two-minute mark on only the second lap. After a few laps of finding the car’s limits, I was able to lay down a best time of 1:59.33. I could finally use the Brembo GT-R brakes and Öhlins Road & Track suspension to their capabilities, pushing back braking zones and diving into turns effortlessly. This was especially noticeable from Cotton Corners and through Bus Stop, where the car’s weight and suspension are constantly loaded to one side or another at more than 80 MPH. The only problem at this point was that although responsiveness improved, the car started hinting at some oversteer in the faster areas. It’s a good thing we brought a rear wing to test as well. 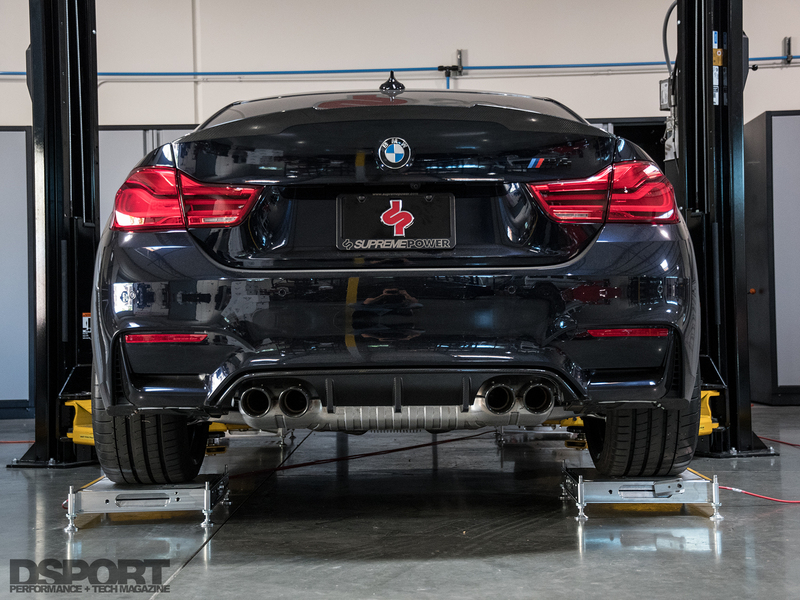 The M2 is back at the Supreme Power shop and already receiving its next round of upgrades, this time focusing on cabin safety and more power. The faster you go, the more effective downforce can be, but it also happens at the expense of drag. Utilizing a BMW Motorsport wing, the same carbon fiber model used on the M235i Racing cars, we’d aim to find a healthy balance of improved traction with little effect on speed. The wing features tall stands to place it in range of cleaner air flow, with large endplates to retain aero efficiency. Back on track once again, the rear wing nearly rounded out everything that the car needed in terms of handling. The car felt much more stable and predictable through the Bus Stop and Riverside corners, while allowing me to comfortably keep the throttle down in these areas without worry of spinning out. This upgrade shaved off more than a full second, proving a best time of 1:58.01. Despite the major time improvement, we did find one more handling issue that may need addressing. It may vary driver to driver, but in my case, the wing was too effective, causing small amounts of understeer in some higher speed areas. We ran out of time for testing, but it appeared that the car would benefit from either running the wing at its flattest setting or to add a front spoiler to balance the front and rear grip. Either way, the combination of brakes, suspension, wheels and tires, and downforce turned a factory-ready track toy into what now feels like a streetable race car. Any enthusiast and racer knows that as a car shaves seconds off of its lap times, it gets exponentially more difficult to trim off even more. The Supreme Power M2 proved to be a challenge to make even quicker, as it already offered impressive numbers in factory form. However, the parts tested in this D’Garage managed to drop its lap times below two minutes on Buttonwillow’s 13CW configuration, which is not an easy feat. Still with sights set on future track days and time attack events, a roll cage with racing seats and harnesses lie in this M2’s future. Once the enhanced safety items are in place, it’ll be time to focus on making more power.